This article highlights a recommended troubleshooting procedure in dealing with a camera problem on Samsung Galaxy S3 mini, in which the device cannot take pictures. 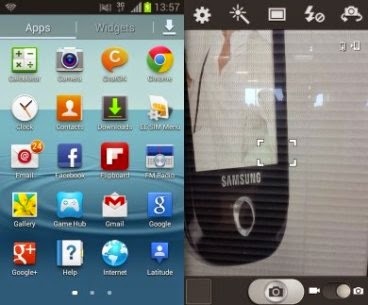 You may refer to this content if you too have encountered same problem on your Galaxy S3 mini camera. Begin troubleshooting the problem by identifying possible cause(s). * Memory card or phone memory is full. One of the reasons why a device may not be able to take photos is when the phone memory or memory card is already full. To resolve this issue, delete some pictures or other unnecessary old contents on your phone or on the memory card. This way will free some space for new picture files to be saved. 2. Tap the Apps icon. 3. Tap the Gallery icon to proceed. 4. Select the Camera folder. 5. Tap the select the image or video file to be deleted. 6. Press the Menu button at the bottom left hand side of the phone. 8. To confirm deletion of selected file, tap OK.
1. Press the Home button and swipe the screen to unlock (if necessary). 2. Tap the Apps icon on the Home screen. 3. Touch the Camera icon to continue. 5. To capture your image, tap the shutter button located at the bottom of the screen. If problem persists after performing the above procedure, then it's possible that the fault is on the phone's camera. Please contact your phone carrier or service provider, escalate your case and get further troubleshooting support. We will also try to find any other possible solutions to this problem and have them added in this post as soon as we find them. Try with this Data Recovery, it enables you to recover lost photos from memory card.